The piece of wire having resistance equal to R is cut into five equal parts. Therefore, power consumption at 100V =? To solve this problem, first of all resistance of the bulb is to be calculated. 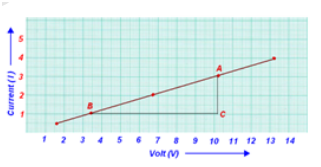 Q.5 How is a voltmeter connected in the circuit to measure the potential difference between two points? Sol. 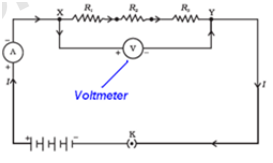 Voltmeter is connected into parallel to measure the potential difference between two points in a circuit. Q.6 A copper wire has diameter 0.5 mm and resistivity of 1.6 × 10–8 Ω m. What will be the length of this wire to make its resistance 10 Ω? How much does the resistance change if the diameter is doubled? Resistance (R) = , therefore length (I) = ? Resistance (R1) when diameter is doubled = ? 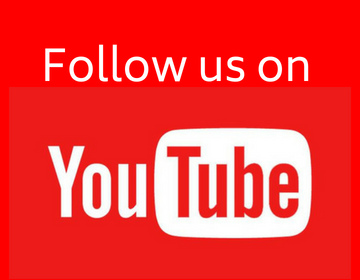 Q.7 The values of current I flowing in a given resistor for the corresponding values of potential difference V across the resistor are given below – Plot a graph between V and I and calculate the resistance of that resistor. Let consider two points A and B on the slope. Q.8 When a 12 V battery is connected across an unknown resistor, there is a current of 2.5 mA in the circuit. Find the value of the resistance of the resistor. Q.9 A battery of 9 V is connected in series with resistors of 0.2 Ω, 0.3 Ω, 0.4 Ω , 0.5 Ω and 12 Ω, respectively. How much current would flow through the 12 Ω resistor? Current through resistor having resistance equal to 12Ω =? Q.10 How many 176 Ω resistors (in parallel) are required to carry 5 A on a 220 V line? Number of resistors connected in parallel =? Thus, there are 4 resistors are to be connected. Q.11 Show how you would connect three resistors, each of resistance 6 Ω, so that the combination has a resistance of (i) 9 Ω, (ii) 4 Ω. Here we have four options to connect the three resistors in different ways. Thus, effective total resistance R = 2 Ω. This is also not required. Thus, R = 4 Ω. This is required. Q.12 Several electric bulbs designed to be used on a 220 V electric supply line, are rated 10 W. How many lamps can be connected in parallel with each other across the two wires of 220 V line if the maximum allowable current is 5 A? Number of lamps connected in parallel =? To calculate this, first of all resistance of each of the lamp is to be calculated. Thus, total 110 bulbs are to be connected in parallel. Q.13 A hot plate of an electric oven connected to a 220 V line has two resistance coils A and B, each of 24 Ω resistance, which may be used separately, in series, or in parallel. What are the currents in the three cases? The current in given three case, i.e. when used separately, when used in parallel, when used in series =? Case – 2 – When the two resistors are connected in series. Power used through resistors of 2 Ω =? Since, current remains same when resistors are connected in series. Since, voltage across the circuit remains same if resistors are connected in parallel. Q.15 Two lamps, one rated 100 W at 220 V, and the other 60 W at 220 V, are connected in parallel to electric mains supply. What current is drawn from the line if the supply voltage is 220 V? Q.16 Which uses more energy, a 250 W TV set in 1 hr, or a 1200 W toaster in 10 minutes? Thus, energy used by it =? Thus, given TV set will use more energy than toaster. Q.17 An electric heater of resistance 8 Ω draws 15 A from the service mains 2 hours. Calculate the rate at which heat is developed in the heater. Rate at which heat is developed in heater =? (a) Why is tungsten used almost exclusively for filament of electric lamps? (e) Why are copper and aluminium wires, usually employed for electricity transmission? (a) The melting point of tungsten is very high, i.e. 33800C, which enables it not to melt at high temperature and to retain most of the heat. The heating of tungsten makes it glow. This is the cause that tungsten is used almost exclusively for filament of electric lamps. (b) To produce more heat, the high melting point of conductors is necessary. The alloys of metal have higher melting points than pure metals. Thus, to retain more heat alloy is used rather than pure metal in electrical heating devices, such as bread-toaster, electric iron, etc. (c) There is loss of voltage in the series arrangement in the circuits because of add on effect of resistances. So, series arrangement is not used for domestic circuits. (d) Resistance of a wire is indirectly proportional to the area of cross section. Resistance increases with decrease in area of cross section and vice versa. (e) The resistivity of copper and aluminium wires are lower than that of iron but more than that of silver. These wires are cheaper than silver, that’s why copper and aluminium wires usually employed for electricity transmission.